S (Scripture): Proverbs 9:8 Do not reprove a mocker or he will hate you; reprove a wise person and he will love you. 9:9 Give instruction to a wise person, and he will become wiser still; teach a righteous person and he will add to his learning. 9:10 The beginning of wisdom is to fear the Lord, and acknowledging the Holy One is understanding. 9:11 For because of me your days will be many, and years will be added to your life. O (Observation): Taking in advice and constructive criticism is a delight to the wise person. A thirst for knowledge is found here. The one who acknowledges that all wisdom and knowledge is due to the Holy One gifting those things is wise. 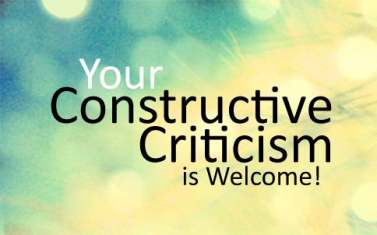 A (Application): For whatever reason, God made me in such a way that I actually enjoy criticism (when it’s constructive). I want to to hear the good and the bad. When I don’t hear the negative side of things, I can’t pray about them or seek to provide clarity or a change of direction, if that is what’s needed. Too often in relationships, and in the church, we sit on our negative thoughts, choosing to let some things fester, rather than bring them to the light, so that we can pray over these issues and talk through them. Seriously, I love hearing good news and great joys, but I also relish the experience to grow and allow the Holy One to shape our futures together. Are you holding something back from me? Call me. Or write it down. Send it to me. Right now. : ). I promise I won’t bite! Are you holding something back from someone you love? Or a co-worker? Air it out. Pray about it. Let me know, and I’ll pray for you!!! Let wisdom take precedent. Share your thoughts. P (Prayer): Lord, soften the hearts of those (like me) who need reproof. Embolden the hearts of those who need to share challenging thoughts. Amen. This entry was posted in Digging Daily and tagged Church, Conflict, Criticism, Reprove, Wisdom. Bookmark the permalink.